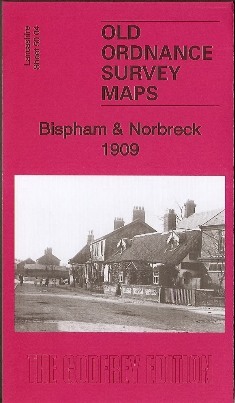 Two detailed maps side by side, sheets 50.04 covering much of Bispham, and adjacent sheet 42.16, extending coverage northward to Norbreck and Anchorsholme. The emphasis is on the area of Bispham nearest the coast, and features include tramway, tram depot, Uptown Farm, Bamber's Farm, Norbreck Hall Hydro, Norbreck House, Red Bank Road, Little Bispham, Bispham Grange. (The map does not include Bispham church.). On the reverse we include a later version of sheet 50.04, showing a much busier Bispham in 1932. Coverage extends inland as far as the new Devonshire Road. New features include the Miners Convalescent Home, library, and streets of housing under development. The map links up with Sheet 43.09 Thornton Cleveleys to the north, 50.08 Blackpool North Shore to the south.